We’ve got to say it: some of you need potty training. Don’t panic, the PCT is nearly entirely poop free. You can walk miles and miles without coming across someone else’s business. Thank goodness. But walk long enough and you’ll develop the outdoors sixth sense: the ability to notice things you didn’t see before. Uncovered feces, barely covered feces, and “toilet paper blooms” (loose TP) are disgusting problems. Human waste is concentrated in and around areas of easy access. If you wait ’til the last minute, you won’t have time to do it right. Set a goal to never defecate at camp. The rule is 200 feet from water, camp and trail. That’s a minimum. Go further. Go a half a mile. Get away from that lake where everyone sleeps by doing your business after you’ve packed up camp and started your hike. Having the right gear is a hallmark of a skilled and experienced hiker. 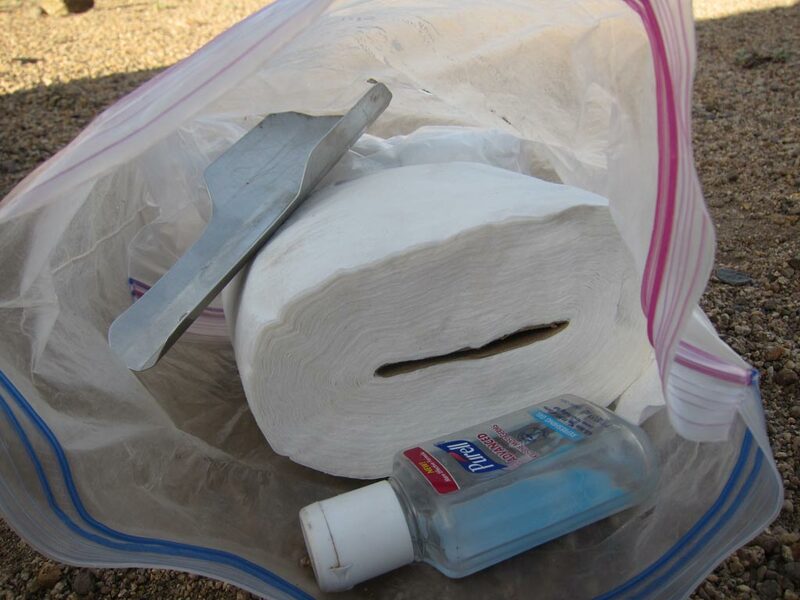 In addition to toilet paper in a ziplock, you’ll need hand sanitizer, a spare bag to carry out used TP, (freezer thickness seals out smells and lasts a long time) and a lightweight trowel (some weigh less than a AA battery) for digging holes. It’s the bane of our volunteers. You found a rock, rolled it out of its hole, did your business and rolled it back. Toilet paper blossoms from its sides but that’s not even that worst of it. The PCT is essentially 2,650 miles of rocks that we’ve moved. We can’t tell you how many times we’ve gone to harvest a rock for trail repair and picked into your pile of poo. Make a commitment: bury your waste 6- to 8-inches deep, always. You’ve found a secret spot. Keep it a secret by promoting quick decomposition. Stir a little dirt into it before you camouflage your site. Act like a cat: hide your business. TP takes a long time to decompose: pack it out. Wrap a bit of clean TP around the used before putting it in some ziplocks. Keeping it in your pack until you reach the trailhead garbage can, the one in town or the can at home is common practice. It’s no big deal. Packing out your toilet paper is totally not a big deal.